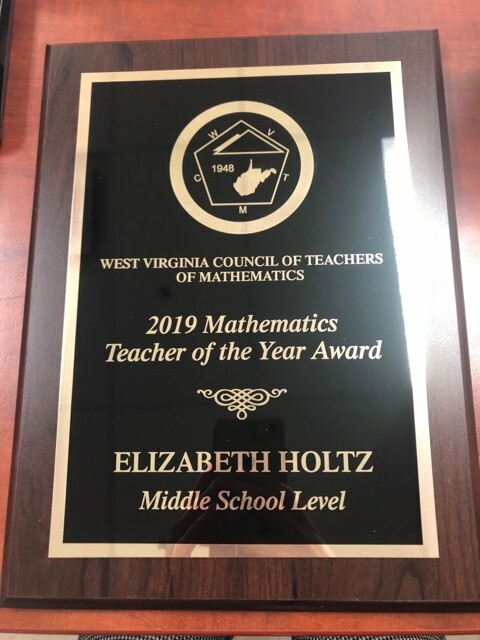 Bridgeport Middle School educator Elizabeth Holtz is the recipient of the West Virginia Council of Teachers of Mathematics Teacher of the Year Award in the middle school division. The award was presented at Stonewall Resort, where the Council’s mathematic conference was held over the weekend. Holtz and her husband Jason attended, but she had no idea she was receiving an award. Mazza had told Holtz that both he and Assistant Principal Gary Oldaker would be out of town and unable to attend. The rest of the story was that Mazza and Mrs. Orton, who also teaches 7th grade math at BMS, had been let in on the surprise that Holtz was receiving the statewide award. As the evening unfolded, there was a spoiler alert, however. “I kind of put 2 and 2 together toward the end of the banquet. There had been no award for BMS and the only thing left were Teacher of the Year awards, so I started getting suspicious,” she said. Plus, her husband had kind of tipped her off earlier in the event. When her name was announced, Holtz said she was happy and humbled. It was her former student teacher, Glen Smithberger, who nominated her for the award. 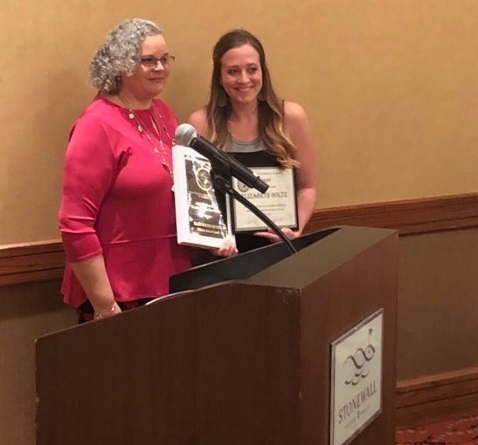 The nomination and selection had been kept secret until Smithberger was informed his candidate had won and he thereafter contacted Mazza and Orton, so they could make sure she was present for the award. This is Holtz’s 10th year teaching 7th grade math at BMS. Before that, she taught one year at Bridgeport High School. She said she is passionate about her profession. Holtz said she knew at a very young age that she wanted to grow up to be a teacher. “From the time I was little, I had a desk at home and would make up tests and give them to my brother,” she said. 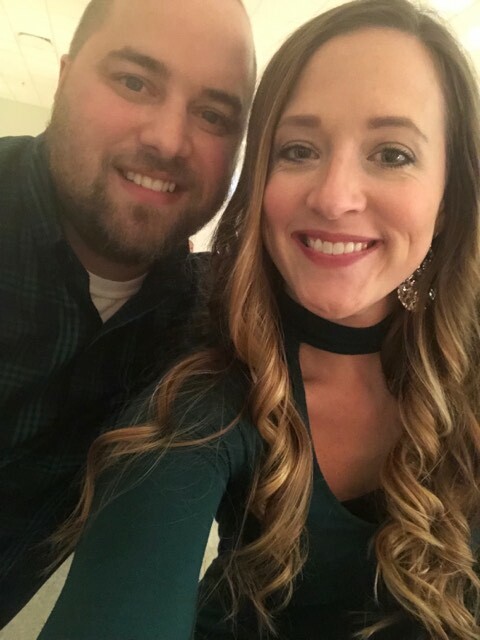 It wasn’t until her senior year of high school, however, that she knew she would follow a teaching path in mathematics. Holtz is certified to teach math in grades through 9th, but she does have an elementary education degree. She attended high school in Connellsville, Pa. and received her undergraduate and master’s degrees from West Virginia University. Holtz said she couldn’t do what she does without the amazing people with whom she works. “The administration, office staff and my fellow teachers make a great team for sure,” she said. BMS is very fortunate to have Holtz on board in its math department, Mazza said. Elizabeth and Jason Holtz have two children, 11-year-old Jackson and 5-year-old Gideon. The family lives in Bridgeport. 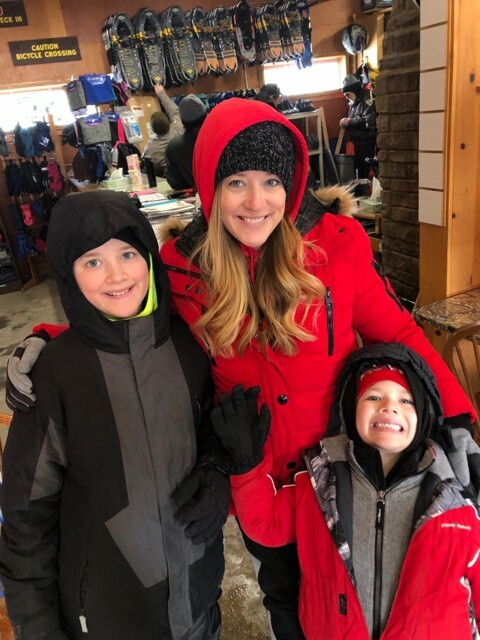 Editor's Note: Pictured from top is Holtz with some of her BMS students, receiving the award from Myrtle Holland of the West Virginia Council of Teachers of Mathematics, with husband Jason and with her boys, Jackson and Gideon.